With engineering and manufacturing capabilities to modify any of our fixtures, and brilliant customer service to guide the process, Boyd Lighting can offer our clients the true luxury of matching their fixture to their interior design. With our built-to-order process, Boyd welcomes the opportunity to customize the size, the finish, the HOA - just about anything - on ourfixtures. We've doubled the stems on a sconce, tripled the length of a pendant, quadrupled the diameter of a ceiling fixture and used clients' colors in the name of personalization. If you can dream it, we can make it a reality. The length of these Ormolu II Sconces was elongated for Roger Thomas and Wynn Las Vegas. Jamie Drake, one of Boyd's top designers, knows that sometimes off-the-shelf just won't cut it. "Clients today expect customization, homes that are tailored to their exact needs," says Drake. What do they want, exactly? "Rooms furnished with pieces that were designed to look right and work right, just for them," he says. This massive Lavaliere Luminaire Grand ceiling fixture (designed by Thomas Fuchs) was customized for a large hospitality interior. "While Boyd Lighting is known for made-to-order, exclusive Boyd Designs as a faster option to custom-lighting, we also have a booming business in custom-modified Boyd fixtures," said CEO, Jay Sweet. "Probably 35% of our specialty designs are modified, in some way, to better meet the unique needs of the designers, architects or end users." Customization doesn't happen only on the small jobs. Roger Thomas, for example, is installing 2,914 customized LED Ormolu Sconces that he designed for Boyd in the new Wynn Palace Cotai set to open next month. (Read "Bet on Boyd" for the full story.) These same custom sconces can also be seen at the Wynn Las Vegas in the Wing Lei Restaurant, (the first Chinese restaurant in the country to be awarded a Michelin Star), and in the Tryst Night Club. At the Grande Lakes Orlando Marriott resort, 11 customized Globe Pendants (designed by Doyle Crosby) hang like moons with an overall height of 126” and a 60” diameter. This custom Globe Pendant has a diameter of 5 feet and a height of 10.5 feet! Modification isn't necessary for everyone, but for those who desire a truly distinctive twist, the result is the difference between ordinary and luxury. Interior designer, Alexa Hampton says it best: "We have reached a point where luxury is uniqueness: the painting was a gift from a friend; the fabric brought back from a trip to Istanbul. Luxury is deeply personal." Need a luxurious nautical sconce for your yacht? Boyd Lighting can personalize one for you. 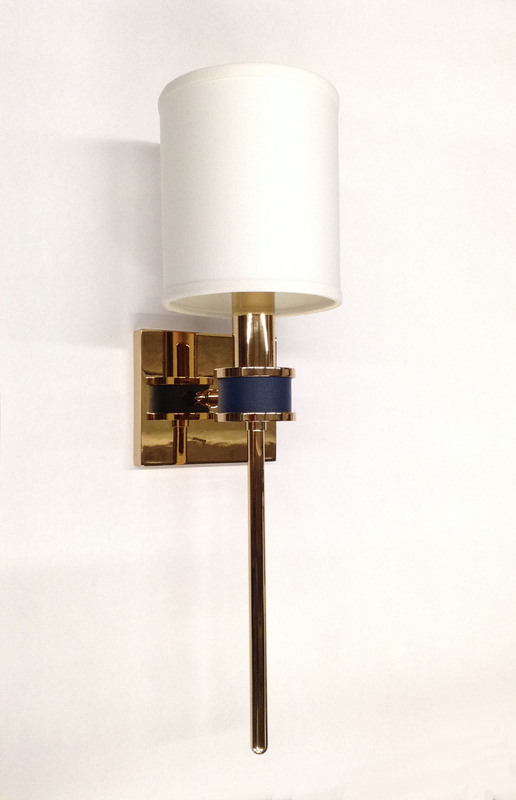 The custom Topanga I Sconce shown above features a gold plated finish and navy blue leather. "Boyd is always available to consider client-specific modifications on more than 200 of our proprietary designs," said Sweet. "Please ask us."